Turn your site into a community with many contributors, or just you. It’s easy with the custom tools we’ve created. Use the directory to build resources such as flights, tours, restaurants and other travel services. Build a website your visitors want to come back to again and again. A destination can be whatever makes sense for your website. If you’re creating a site for a large theme park, the destinations might be the different sections, with rides and activities as the child destinations. A more traditional concept would be a country, region and city relationship, but that’s too easy. 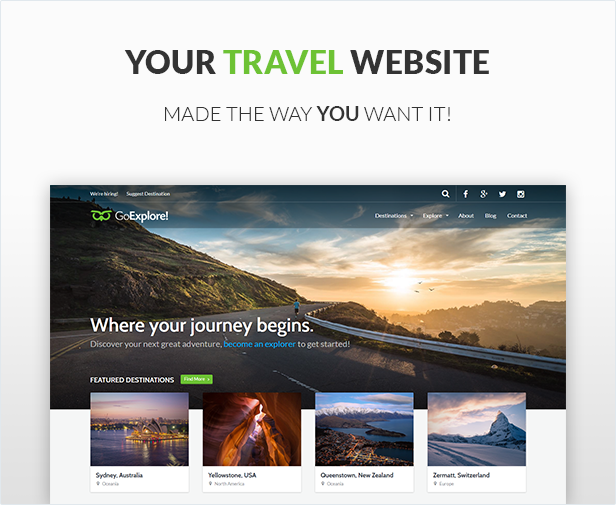 Use your creativity and you’ll quickly see how any travel site can take advantage of the Travel Destinations plugin. Add sub-pages to destinations for extra details and unlimited depth. With the addition of sub-pages, the destination becomes a full featured travel guide. Each destination has it’s own directory for cataloging restaurants, tours, activities, museums, and much more. You create the categories and decide what types of ratings apply. Choose from stars and dollars, or add the ones you need. If we didn’t include a ratings symbol, add your own for custom scales to rate your directory items.